Catch the crook before he tows the safe away! 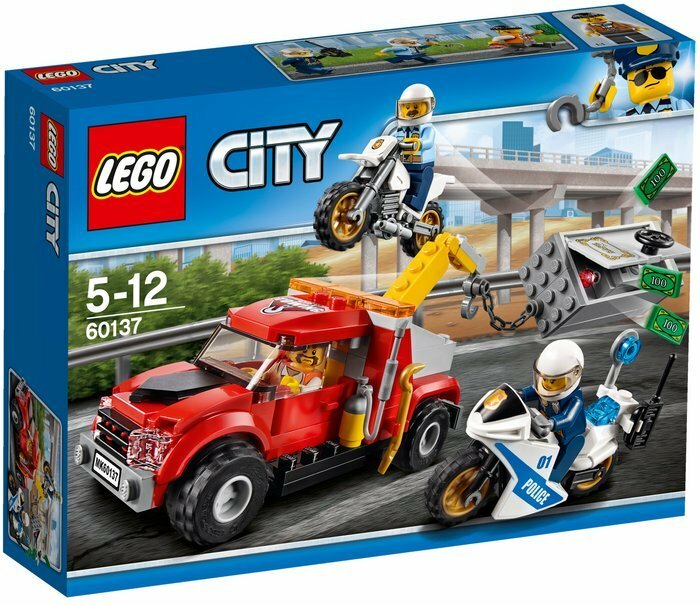 Be part of the action with the LEGO® City police as they race after the crook trying to tow away a safe. This set includes a tow truck with winch arm and hook, police off-road bike and a police pursuit bike with radio, plus a safe with a large opening door and smaller compartment inside, money bills, jewel and other accessory elements. 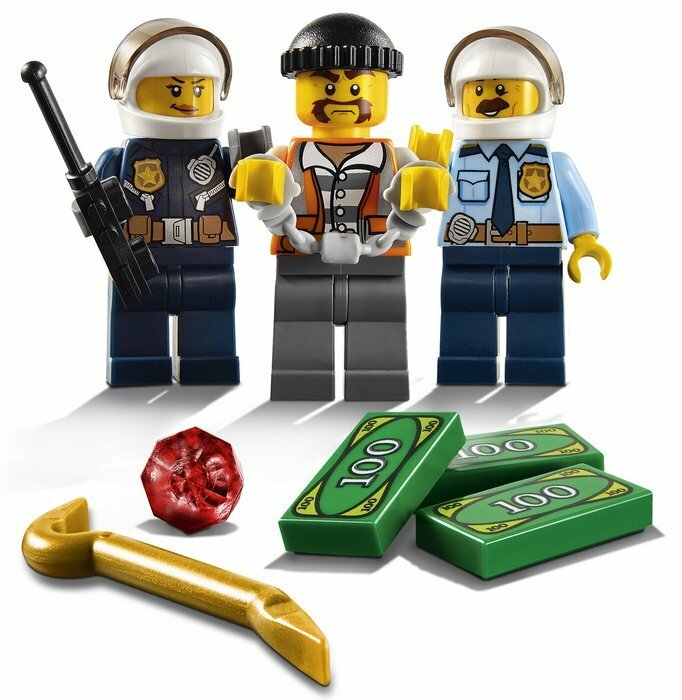 Includes three minifigures: two police officers and a crook. 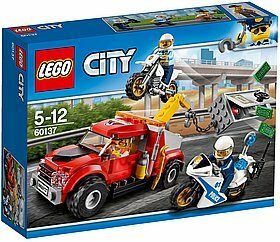 Features a tow truck, a safe, police off-road bike and a police pursuit bike. 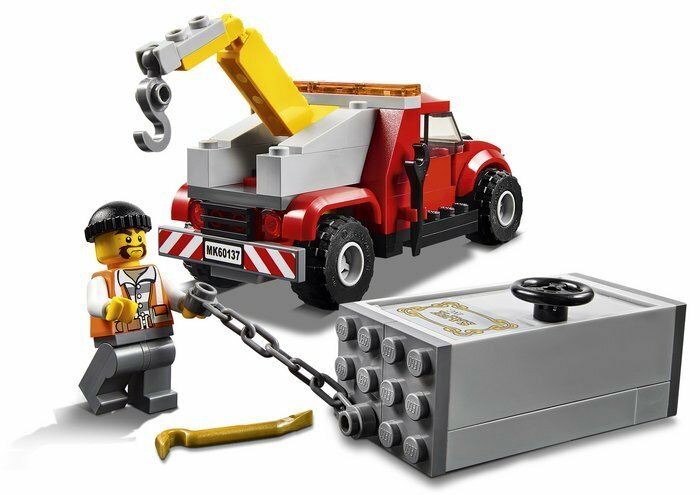 Tow truck features a movable tow arm with hook. 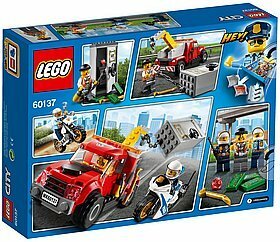 Police pursuit bike features a lollypop stop sign and police radio. 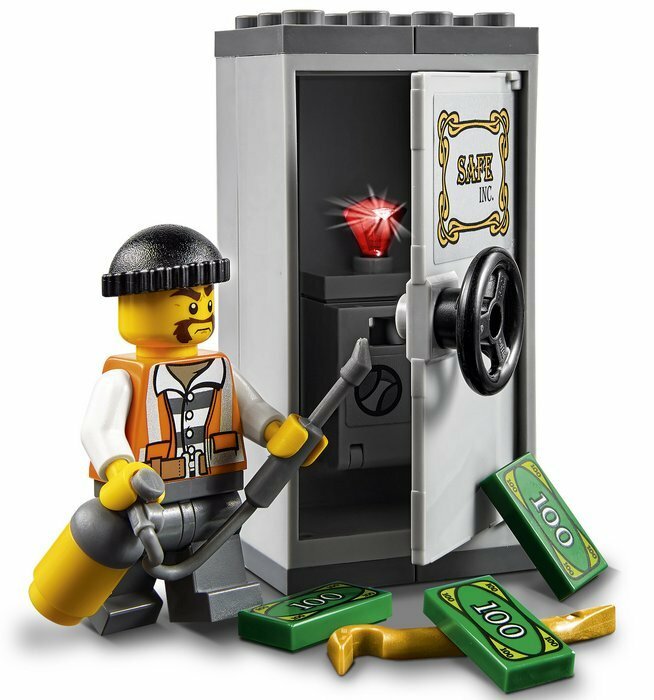 Also includes a safe with large opening door and smaller compartment inside, with space for money bills and a jewel. 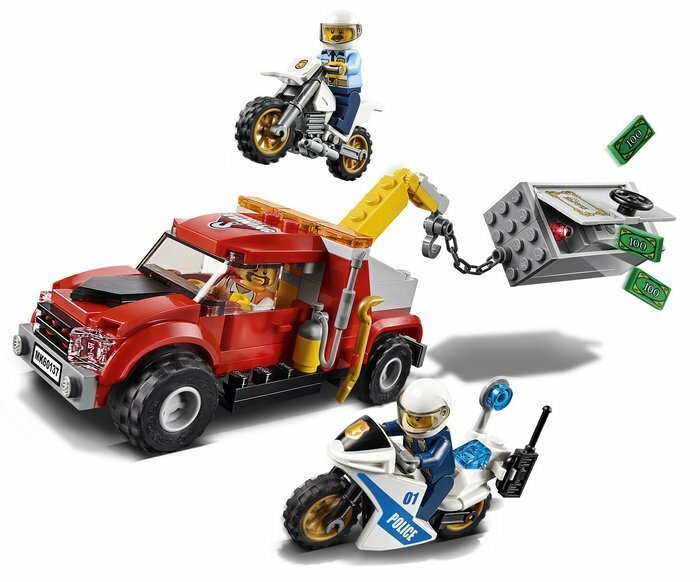 Chase the tow truck and safe with the police bikes as the crook tries to escape. Use the police radio to coordinate and set a trap for the crook. Stop the tow truck and haul the crook back to jail. 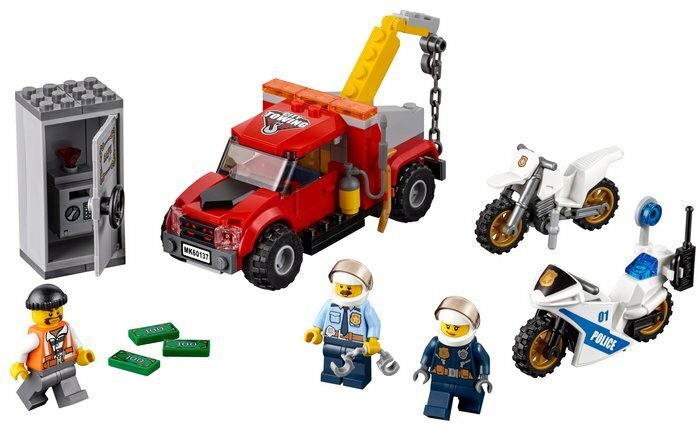 Accessory elements include three money bills, a walkie-talkie, wrench, crowbar, welder’s torch, handcuffs, lollypop stop sign and a jewel. 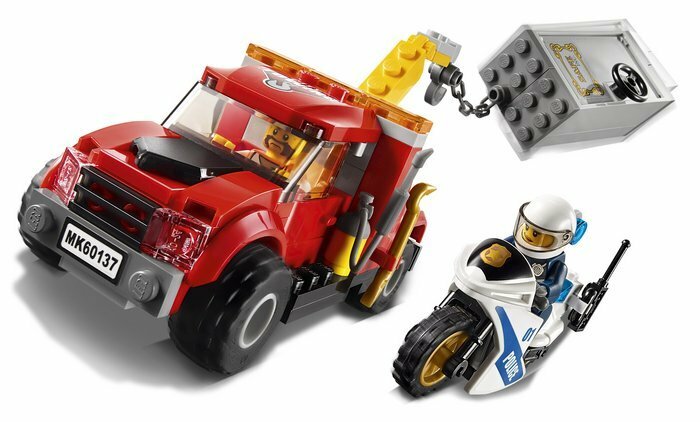 Tow truck measures over 2” (6cm) high, 4” (12cm) long and 1” (5cm) wide. Off-road bike measures over 1” (3cm) high, 2” (7cm) long and 1” (3cm) wide. 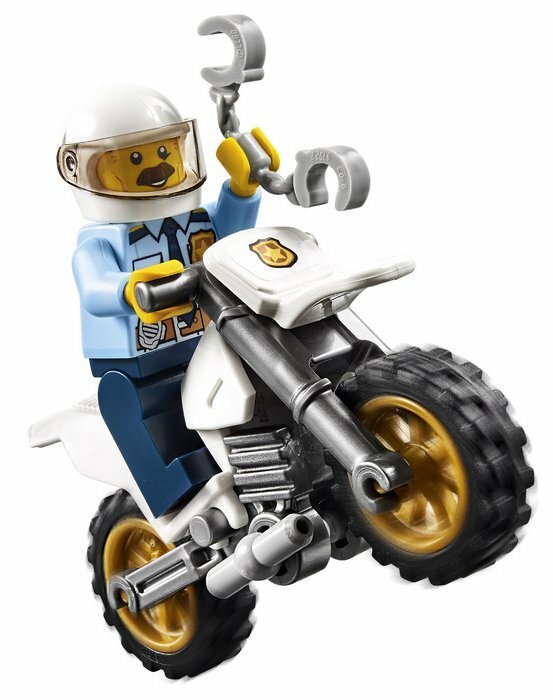 Pursuit bike measures over 1” (3cm) high, 2” (7cm) long and 1” (3cm) wide. Safe measures over 2” (6cm) high, 1” (4cm) wide and 1” (3cm) deep.